Near Field Communication, or NFC, is the latest technological advance that promises to change the way retailers and consumers communicate. Consumers with a smartphone can easily transfer funds, files or receive information with the tap of a button. This gives consumers and retailers the ability to communicate in real-time, benefiting both parties. In the future, it is possible that all anyone will have to carry is their smartphone, leaving behind bulky wallets, cards and keys because the phone will be able to do it all. NFC is a probable solution for large stores, such as supermarkets, as well as small boutique retailers. Basically anyone who wants a more advanced way to interact with their customers is eligible for this advance in technology. All consumers have to do is hold their smartphone near a tagged item, and they can obtain any information you wish to communicate with your customer within seconds. Today, there are many ways to pay and go, speeding customers through checkouts, but NFC promises to take that premise up a notch. More than a way to pay, it also allows users to check into the establishment or store, enabling retailers to send time appropriate offers and coupons directly to the user’s smartphone. When a user redeems the coupon, they can then use their NFC device to pay for their purchase. It also gives consumers the ability to comparison shop right from the phone while in a store. With a click of the phone, consumers can receive detailed information, reviews and prices at other stores – similar to what they do now with mobile shopping but in a quicker fashion. When trusted brokers are allowed access to the NFC, they can create qualified leads and specials that are targeted to the customers who used the device, basing their information on past purchases and coupons redeemed. The NFC takes the seamless experience for consumers to a new level. Shoppers can get personalized information when they need it and when they are most apt to use it. Retailers can benefit by having the ability to capture consumers right when they are in their store. The eventual goal is to provide consumers with incentive to come back to the store, as well as opportunities to cross-sell and upsell. 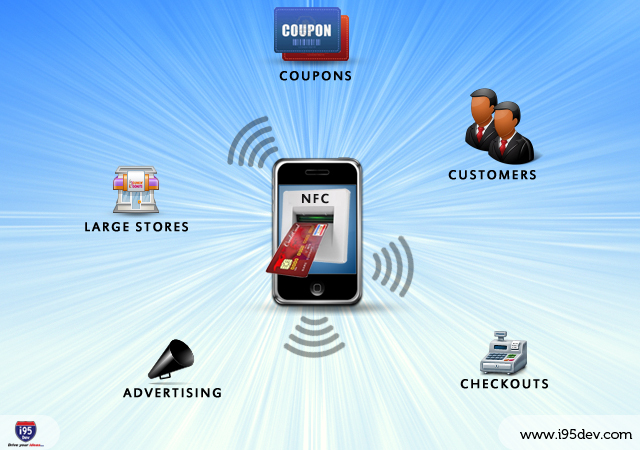 Mobile NFC is a versatile way retailers can use technology to increase sales, efficiency and customer satisfaction. Retailers should explore the uses NFC offers and see how it can benefit their business. It promises to be the most efficient way to increase sales and customer satisfaction with little investment.